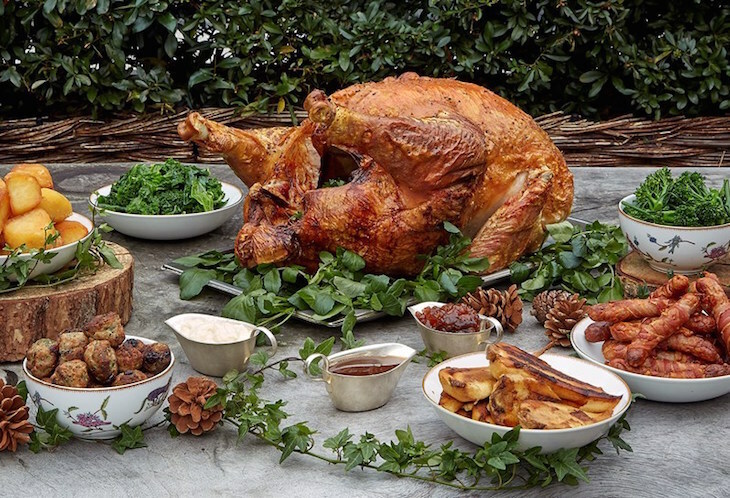 Which restaurants are open in London on Christmas Day? 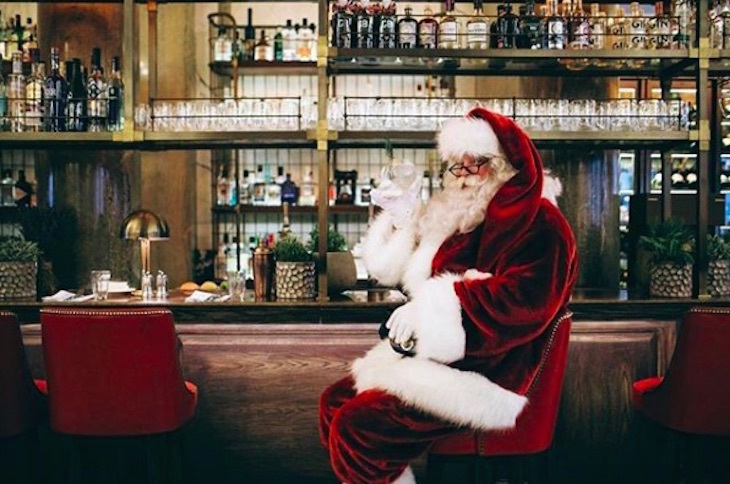 Whether you're visiting London over the festive period, or are a Londoner wanting to dodge the cooking, we've put together a guide to eating out in the capital on Christmas Day. Most restaurants won't be open, and it tends to be the high-end (read: pricey) ones which do, with set menus to choose from. 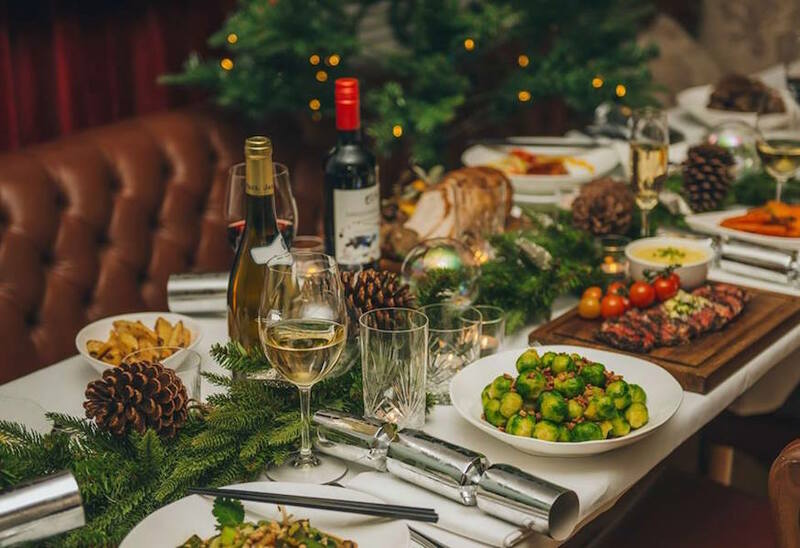 So if you want to treat yourself to Christmas lunch at a fancy restaurant or hotel in the capital this Christmas, these are some of your options. You'll need to book in advance for 25 December, as many of these places get filled up months in advance. Salmon, pork belly and venison tartare are on the menu at One Aldwych — and that's just the starters. Go traditional with turkey breast and bacon-wrapped chipolatas followed by Christmas pudding, or mix it up a bit with sea bass or beef, all served with vegetables. 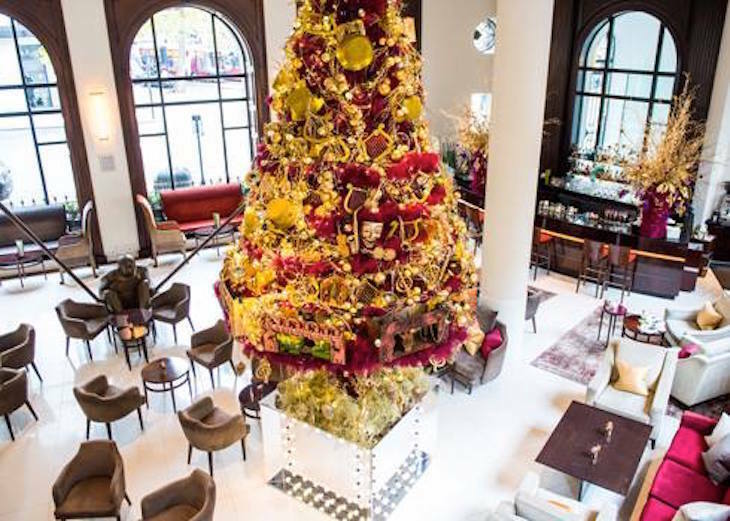 The festive afternoon tea is also served on Christmas Day, and the hotel lobby always looks fantastic at Christmas, with a themed tree taking centre stage. Definitely one to book if you're going all out festive. From £110 per person, served 12pm-8.30pm. Village East in Bermondsey is open on Christmas Day serving the full works and all the trimmings. 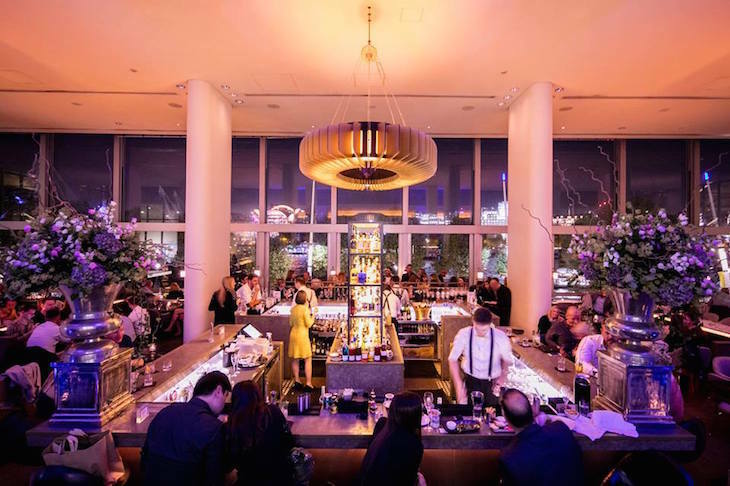 The three course set menu has the traditional options, as well as the likes of confit duck croquettes with hoi sin sauce, and blackened miso cod. There's no Christmas pudding for dessert (sorry, traditionalists); choose from bread and butter pudding, flourless chocolate cake, or a cheeseboard. £75 for three course set menu, served 12pm-4pm. You'll be handed a festive Bellini on arrival at Asia de Cuba, before settling down to coffee-crusted ribeye or roasted Norfolk turkey. As you'd expect from a Latin-Asian fusion restaurant, there are a few twists on the classics — think seven spice chicken as a main, and Mexican doughnuts for dessert. There's a separate children's menu for under 12s too, with burgers, chicken nuggets and the like for younger vegetable swervers. Christmas dinner in a sleek, modern restaurant overlooking the Thames? Don't mind if we do. Skylon is hosting its second Christmas opening, with a single five course menu available across the grill and restaurant. 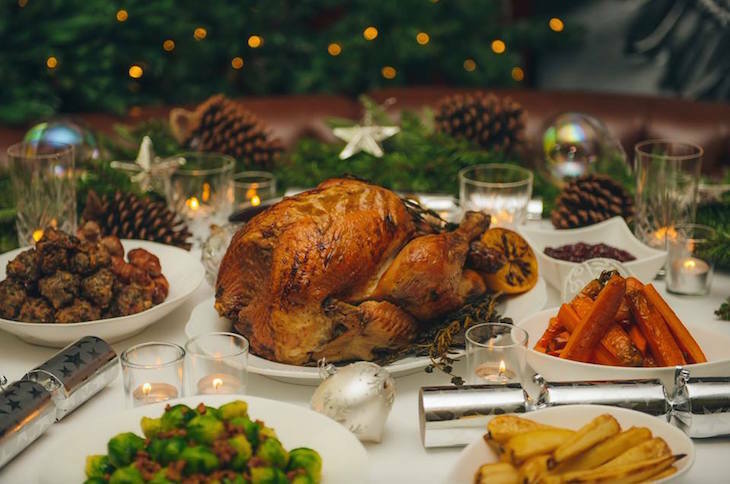 It's a traditional affair, moving from canapes to a turkey roast, and finishing up with Christmas pudding, although there is a separate vegetarian menu — veg wellington is the headliner — and a kids's menu, still traditional but with a bit more choice. £125 for five course set menu. You'd think that by lunchtime on Christmas Day, Father Christmas would be ready for a long lie-down. Instead, he pops into Holborn Dining Room to visit the diners. The menu sounds very luxurious, and has plenty of options — anyone for baked lobster thermidor tart or foie gras, followed by traditional roast turkey or wild sea bass? For dessert, we're eyeing up the chocolate fondant, but other options include mandarin cheesecake, raspberry and almond trifle, and spiced custard tart. Save some for Santa. £145 per person for set menu. Start your meal at Ham Yard Hotel with a selection of canapes and a glass of champagne, followed by seasonal specials — glazed ham terrine, slow cooked fillet of beef, traditional Christmas pudding and, our favourite, gingerbread cheesecake. Good, wholesome, festive nosh, very close to Piccadilly Circus. £110 per person for set menu. Sea Containers, inside the swanky Mondrian London hotel by the Thames, is open for both lunch and dinner on 25 December. The menu is the same for both sittings and rather fancy — you'll get a 'pre-starter' of celeriac soup, followed by a starter (rabbit terrine is one of the options), a main (traditional turkey, beef, halibut or pasta) and dessert. Tea, coffee and mince pies will follow, if you've still got room. Walk it all off on a stroll down the Thames. £115 per person for set menu. 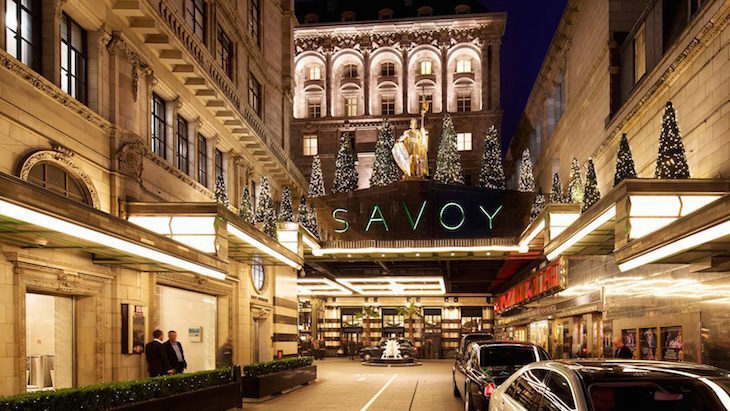 The Savoy goes all out for Christmas, and we'd expect nothing less. Trees, wreaths and fireplace garlands can be added to the rooms and suites of those staying there, but if you're not lucky enough to be a guest, you're still welcome for Christmas lunch with several luxurious options available. Festive afternoon tea is served in the luxurious Thames Foyer, with classic and seasonal sandwiches, freshly baked scones and a festive twist on the usual sweet treats, including festive fruit cake and a salted caramel Christmas bauble (from £68 per person). 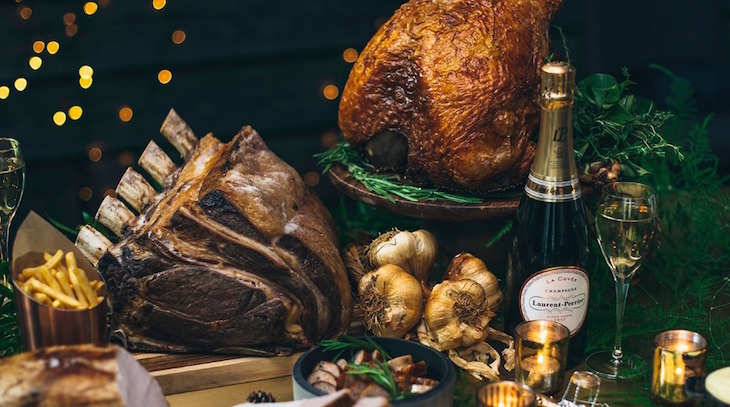 The Christmas Day menu at Kaspar's (£230 per person) ranges from traditional turkey — served with garlic whipped potato, honey glazed carrots, and all the trimmings — to pumpkin and sage tortellini and ox & ham pie. Finally, the Savoy Grill offers a lunch menu (six course, £230 per person) and a dinner menu (five courses, £160 per person), both of which make us exhausted just looking at them, never mind trying to eat them. 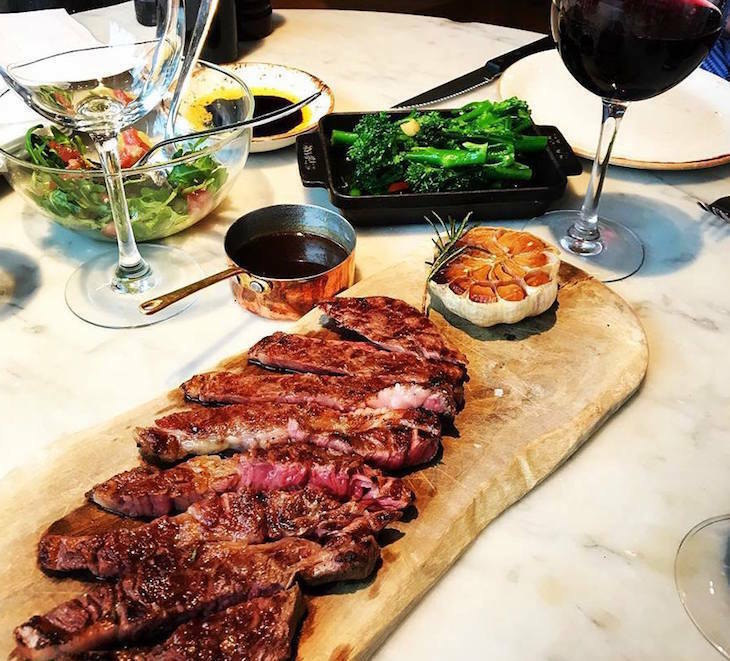 Michelin-starred chef Tom Kerridge opened Kerridge's Bar and Grill at the Corinthia in August 2018. The Christmas Day menu is pretty standard fare, done to a high standard. Turkey or rib of beef are your main options, preceded by dishes such as duck liver parfait, salmon vol au vents and cream of chestnut soup. £22o per person, served midday-4pm. 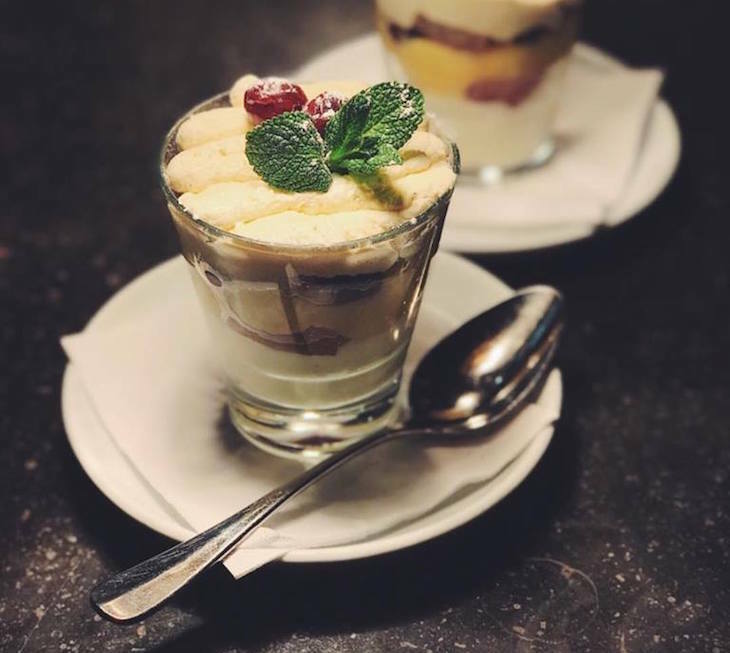 Venetian restaurant Tozi leans away from your traditional English Christmas fare, and embraces its Italian roots — you won't event find turkey on the Christmas Day menu. Instead choose from chargrilled sea bass served with lentils and parsnip crisps, or roasted stuffed guinea fowl with chestnuts, shallots and potatoes. Buffalo ricotta ravioli, pumpkin tortelli, warm panetonne and Robiola Rochetta (a soft Italian cheese) also feature. £68 per person for set menu. Looking for more festive things to do? Take a look at our guide to spending Christmas 2018 in London. Why not walk off all that turkey (or sea bass) with a stroll through London's Christmas lights.